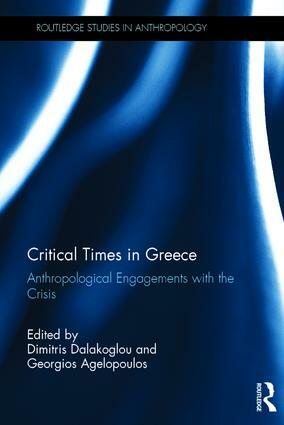 This volume brings together new anthropological research on the Greek crisis. With a number of contributions from academics based in Greece, the book addresses a number of key issues such as the refugee crisis, far-right extremism and the psychological impact of increased poverty and unemployment. It provides much needed ethnographic contributions and critical anthropological perspectives at a key moment in Greece’s history, and will be of great interest to researchers interested in the social, political and economic developments in southern Europe. It is the first collection to explore the impact of this period of radical social change on anthropological understandings of Greece. 6. The Concealed and the Revealed: Looking to the Hidden Bounty of the Land in Crisis Times. 9. The “Greek Crisis” and the New-Poor. The Being, the Phenomenon, and the Becoming. Dimitris Dalakoglou is Professor at Vrije University Amsterdam, The Netherlands, where he holds the Chair in Social Anthropology. In 2012 he was awarded an ESRC Future Research Leaders grant for his project, Crisis-scapes, which studied urban spaces and crisis in Greece. Georgios Agelopoulos is Associate Professor of Social and Political Anthropology at Aristotle University of Thessaloniki, Greece. He has carried out research in Greece and the Balkans since the 1980s and is part of the Europe-wise project 'Framing Financial Crisis and Protest'.